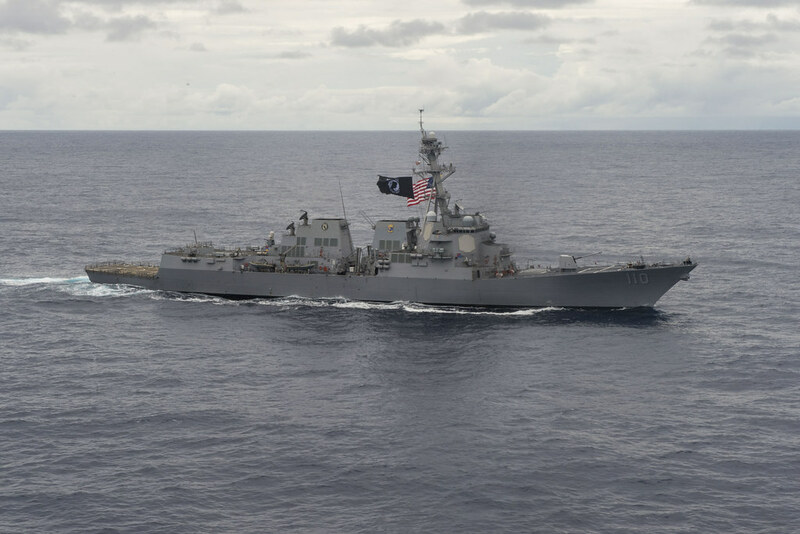 WATERS TO THE EAST OF THE KOREAN PENINSULA - Guided-missile destroyer USS William P. Lawrence (DDG 110) rejoined the John C. Stennis Carrier Strike Group (JCSSG) March 11, upon completion of her Oceania Maritime Security Initiative (OMSI) tasking in the Western Pacific. "By transforming energy use and awareness, we become a more flexible fighting force -- whether in the waters of the Western Pacific or in the waters we sail closer to home," said Rear Adm. Ron Boxall, Commander, John C. Stennis Strike Group. "That flexibility becomes more operational time on station, more time to build partnerships, and more time to promote peace and stability in the region." During OMSI tasking, Lawrence burned an average of 20,159 gallons of fuel per day -- 4.4 percent of her total fuel capacity, which is 40 percent less than her average fuel burn rate in 2015.